When the winder mechanism is a little off try to get a broken Yashica A. 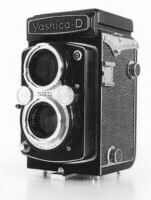 They come very cheap and you can swap backs and end up with a Yashica D with a red window. When you want to use the normal winding system but double-check using the red window, you might want to experiment a little to see where you have to put the line in order to precisely stop when the red window shows the "1". The cable release should be of the Leica / Nikon type or alternatively you can also try to find a convertor-screw. When you have found a release cable you can attach the cable by screwing off the protection ring around the shutter release button. Using a lens hood with your Yashica is a must. Not using one often results in lower contrast pictures. 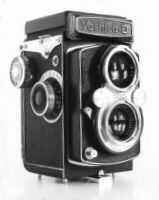 Best is to look for a Bay-1 Hood such as the older Rolleiflex type Bayonet. Filters and Close-Up lenses can also be used, just make sure you'll get a Bay-1 version. You can also use a Bay-1 > 49mm Adapter ring but this may obstruct the viewing lens so you might not see part of the picture you'll take.